The bull shark is a large-bodied shark that is characterized by its relatively small eye, triangular dorsal fin and short snout. It has a cosmopolitan distribution and even ventures into freshwater rivers and lakes. This wide-ranging species has been observed in the waters of all Dutch Caribbean islands, except around Curacao. 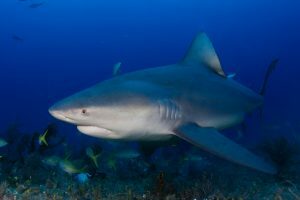 It is often viewed one of the most dangerous shark species, but incidents between bull sharks and people in the water predominantly occur in tropical areas with turbid waters. Since the bull shark prefers estuarine and inshore waters, one of the major threats for this species is habitat modification and pollution. 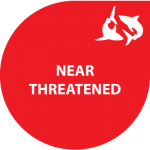 The bull shark is globally listed as ‘Near Threatened’ on the IUCN Red List, with global population trends classified as unknown. Normally these sharks are not targeted by commercial fisheries, but they are caught as bycatch in multi-species fisheries. But its size and impressive appearance do make these sharks a wanted target in recreational fisheries. Despite venturing into freshwater from time to time, this species is mainly associated with reef habitats at depths ranging from the surface to about 30 meters. Young bull sharks tend to spend their early years in shallow waters like bays and estuaries, finding shelter from larger sharks. The maximum size for this species that has been recorded is four meters, while bull sharks are born at a length of approximately 60 cm. Like many other shark species, these sharks mature relatively late at an age between 10 to 15 years. Bull sharks can live for at least 32 years. Like most other requiem sharks, the bull shark is life bearing with litter sizes ranging from 1 to 13 pups. From the stomach content of a bull shark you can see they are real fish-eaters, consuming mainly bony fish and other elasmobranchs (sharks and rays). Juveniles will also eat crustaceans and gastropods. The biology of bull sharks is remarkable, because they have the ability to swim in both salt water and fresh water. They do this by adjusting the function of their kidneys to their surroundings, by regulating the amount of ureum and how frequently they urinate. Bull sharks have been recorded up to 4200 km upstream of the Amazon River, 2800 km upstream of the Mississippi River and 1120 km up the Zambezi River. The latter caused the bull shark to be also known as ‘Zambezi shark’ in Africa.